Tonight, the celebrity Housemates all nominated for the first time - face to face - during a special live show on Channel 5. Each Housemate was issued with one board and a pen and told that they would each make one nomination. 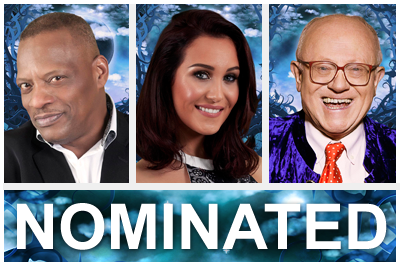 As Alexander and Chloe have already been chosen by Katie, they could not be nominated, but could still nominate. Michelle nominated Ken because "he said he wants to go home"
Perez nominated Ken "for the very same reason Michelle gave"
Katie nominated Perez because "he really annoys me in the morning"
Nadia nominated Katie saying, "it's highly unlikely we will ever agree on anything. We're polar opposite women"
Cami-Li nominated Ken "because he makes fun of me"
Jeremy nominated Patsy saying, "I would always kill off the weakest member of the pack"
Chloe nominated Ken because "he's been saying a few words that tread a fine line"
Calum nominated Ken "because he doesn't want to stay and would be happy to go home"
Kavana nominated Ken because "he wants to go home and he doesn't lift a finger in the House"
Ken nominated Cami-Li "because she bit me without my permission"
Alicia nominated Calum because she thought he would be "the safest person here"
Patsy nominated Ken because of "bathroom-gate"
Keith nominated Perez because " he sticks his arse on the work surface and I don't want skid marks in my cheese sandwich"